Sparkle Rise RECAP – Sparkle Mudder? On Friday night, The Rise NYC had its very first Sparkle Rise workout and it was nothing short of sparktacular (and a bit muddy)! Things got dirty pretty quick! We met at the USS Maine Monument at Columbus Circle after a day of on and off rain. The rain passed just in time as we put on our sparkle hats & glow sticks and started our [Sparkle Mudder] tour of each day’s Rise workout. The concept is simple: The individual day leaders put together an 8 minute circuit to give us all a taste of what their day’s workout is like. We started with a quick 3-minute cardio circuit to get the heart rate up and the blood flowing. Thanks to Cat & Jen for putting it together! After that, we didn’t waste any time getting down and dirty rolling around in the gravely dirt. It started with Monday’s HIIT-style workout led by Rachel and Christina. This involved two sets of 4 exercises. 20 seconds on, 10 seconds off, repeat twice. You can bet there were plenty of high fives along the way. If you liked what HIIT was all about, you can get a full 30 minutes of it at the fountain at Washington Square Park at 6:30am every Monday. Afterwards, the groups heads over to Oatmeals for oatmeal and coffee. From Washington Square Park, we hopped on the D train to Atlantic Terminal and ran up Flatbush to Grand Army Plaza for a taste of the Brooklyn Badass Body Circuit. Kate led us in a non-stop circuit of 4 exercises for 30 seconds each, repeated 4 times. They were perfectly themed spins on some of our favorites – sparkleboarders (snowboarders), commandGLOWS (commandos), flash dance (high knees), and shimmer taps (shoulder taps). Catch the Badasses at Grand Army Plaza every Tuesday at 6:30am! It was also right around this time that the NYC Parks patrol showed up for some extra excitement. The workout went on as we used our Rise charm to convince them to let us stay. With that excitement behind us, we then went back down Flatbush (after stopping for some coffee at Brookyn’s post-workout hangout Hungry Ghost first) to Atlantic Avenue to get back on the D train. This time, we headed up to Bryant Park to experience part of a Wednesday workout. We opted for a Wednesday staple – bag of balls. Ben got us going with the instructions – as a team of 4, you have 1 person sprint to a bag of tennis balls, grab one and run back to the team. The team then does the exercise written on the ball while the next person runs to get a new ball. On and on we go for 8 minutes. Swing by 6th Avenue/fountain side of Bryant Park on Wednesdays at 6:30 for bag of balls, deck of cards, and endurance challenge, and hang out with the crew at Pax for some coffee afterwards! From there, we got on the F train and made the voyage to the beautiful and magical land of Forest Hills, Queens! Vanja and Zoran gave us a taste of a pyramid circuit they do to finish their workouts at MacDonald Park every Thursday. Pyramids are no joke! 2 exercises done 1,1,2,2,3,3, up to 10 and then back down. That’s 100 of each exercise! The Queens crew always offers a great workout and they meet on Tuesdays AND Thursdays at 6:30am at MacDonald Park. We didn’t do anything to represent the Friday Rise (hill running at the Williamsburg Bridge) since we didn’t have a hill. Instead, we let the PEOPLE RULE THE RISE by going around the circle and having Risers give their favorite exercise, which we then did together. And to completely top off the workout, we did a Brooklyn Classic – the Blur Burpee Burnout – a combo of jumping jacks and burpees timed to the WOO HOOs in Blur’s Song 2. Thank you to Christina! Chad! Kate! Rachel! Christine! Theo! Jen! Ian! Zoran! Vanja! Ian’s co-worker! Hannah! Shannon! Cat! Erica! Huy! And BEN behind the lens! Special Rise Up to our rocks and first-timers! After our traditional Rise family photo, we headed over to Gossip bar for some fine-mannered frivolity and classy conversation. Thank you again to everyone who braved the rain and had nary a complaint about rolling around in the mud to get a sparktacular Rise workout in. It was great to see old faces and new! The Rise is nothing without your support and enthusiasm and we look forward to seeing again – bring a friend! 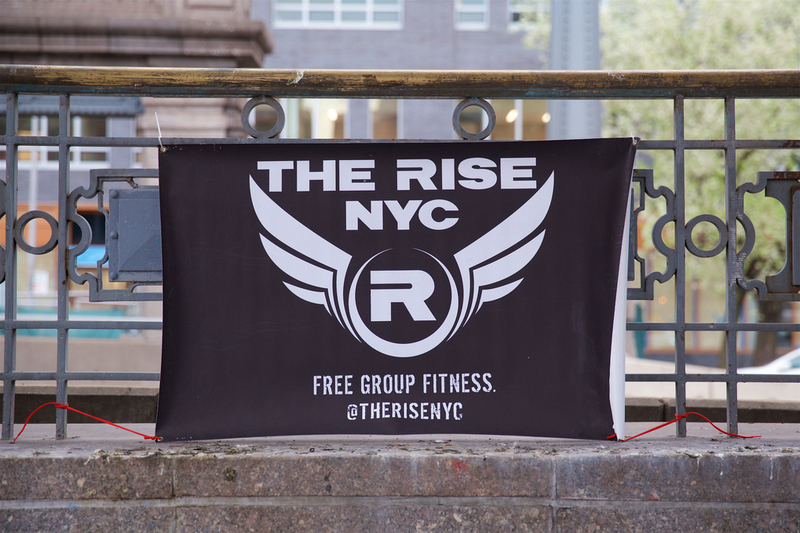 Be on the lookout for more Sparkle Rise workouts, in addition to other special evening & weekend workouts from The Rise NYC. If you have a suggestion for a place to hold a special workout, please let us know! RISE UP and RISE ON!